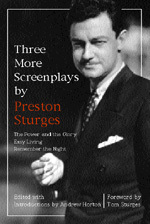 The publication by the University of California Press of Five Screenplays by Preston Sturges and Four More Screenplays by Preston Sturges has been applauded by cinephiles and admirers of the director's work, and recognized as a major contribution to the history of American cinema. In this third volume of scripts by one of Hollywood's wisest and wittiest filmmakers, the focus turns to those screenplays written but not directed by Sturges. Included in the new collection are The Power and the Glory, which greatly influenced Orson Welles in the conception of Citizen Kane, and the romantic comedies Remember the Night and Easy Living. The scripts reveal Sturges in top form as a writer of dialogue and prove beyond any possible doubt his authorship of the films, which frequently appear indistinguishable on-screen from those he himself directed. Full of surprises and delights, these Three More Screenplays are essential reading for students of American cinema and admirers of Sturges. They cast new light on his collaborations with directors Mitchell Leisen and William K. Howard, and provide a rousing conclusion to the writings of this Hollywood master. In his substantial introduction to the volume, film historian and screenplay writer Andrew Horton analyzes the contributions of Sturges to the film comedy genre and to Hollywood film history. Preston Sturges (1898-1959) was a member of Hollywood's gifted royalty. He wrote, directed, and produced a remarkable number of successful films, and wrote and produced for the Broadway stage. Andrew Horton, Jeanne H. Smith Professor of Film Studies at the University of Oklahoma, is the author of Writing the Character-Centered Screenplay (California, 1993) and coeditor (with Stuart McDougal) of Play It Again, Sam (California, 1998). Tom Sturges, who conceived this series of books, is the general manager of Los Angeles-based T.W.Is.M. Records. He is working on a one-man play about the life of his father, Preston Sturges.